Command attention with our 1776 United Logo Tee! 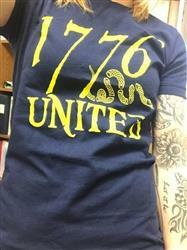 Grab one in Navy or Black, complete with 13 stars on the left sleeve for the Original 13 Colonies! Love love love it! Team America! Absolutely perfect! Can’t wait to buy more! I absolutely LOVE my t-shirt!! So comfortable. I was given a card with 15% off on another item so I bought 2 more, The Give Me Liberty tee and the St. Patrick's Day Tee. There is so much more stuff I saw that I want to order so I will be a frequent customer.. I watch Joe Biggs' show Rogue Right on Liberty One tv every evening and he is awesome for showing off your stuff and new stuff that you guys put out. I love the stickers you gave me as well with my first purchase thank you for that., You guys are awesome!! My order was rerouted but it was only a day off from the delivery date on my statement. Very happy with my purchases and the quality, will DEFINITELY be ordering more! I love the shirts I ordered. I get so many compliments on them. They are so soft. I always make sure to wash them on cold and air dry.